ECHO's latest Technical Note is an in-depth look at how to harvest, preserve, and use bamboo for building construction. 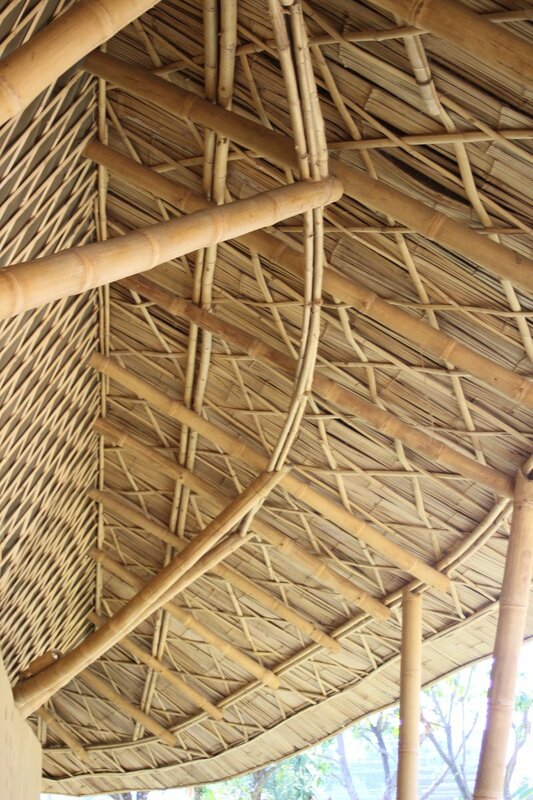 Filled with tips on bamboo species, drying techniques, and modern and traditional joinery, this technical note contains helpful pictures of the tools and lashings needed to build lasting structures using this widely available, and sustainable material. Bamboo is one of the fastest growing plants in the world, and a single culm can reach a height of over 100 feet in just one growing season--but it is best to wait three years for that culm to reach full maturity before harvesting. Once a bamboo culm reaches maturity, it will be much stronger. Culms begin to die roughly 8 to 10 years after they emerge as shoots, so the ideal harvest window is between 3 and 8 years of age. Knowing this, how can you distinguish the age of a culm when you go to your bamboo clump to harvest? One method, which requires a considerable amount of patience and forethought, is to record the year on each culm as it emerges. This can be done with long-lasting grease pens, markers, or paints, or simply by scarring the outer layer of the bamboo with a knife or stone. This method, used diligently, will allow you to know the exact age of every culm in the clump.